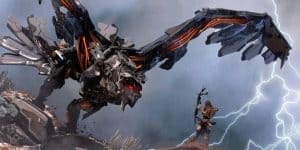 Horizon Zero Dawn: Patch 1.04 Improves Quest Glitches | Nerd Much? Guerilla Games announced recently that it has a brand new patch for Horizon Zero Dawn, which fixes quite a few major glitches players have been having with main and side quests. That said, the fixes quoted below contains quite a few spoilers. If you have any more problems or issues to add, by all means comment on the update and let the developers know. Your feedback is what keeps patches like these coming in and improving gameplay. In addition, Guerilla would like to let you know that it is are aware of the bug showing doubled armor stats. The extra stats do not affect gameplay, so be careful before you bite off a bigger piece of dinosaur than you can handle. The studio is working on it and the fix will likely come in the next patch. Warning: Spoilers for Horizon Zero Dawn ahead. Have you experienced any of these issues? Have they been very disruptive to gameplay? Let us know in the comments below!